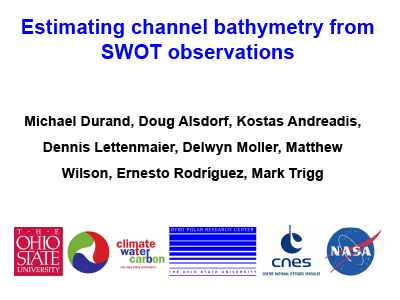 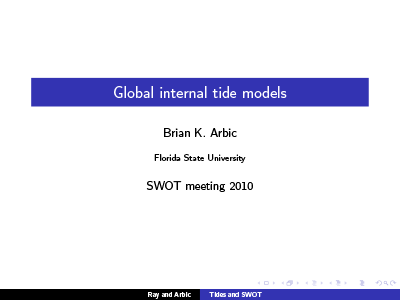 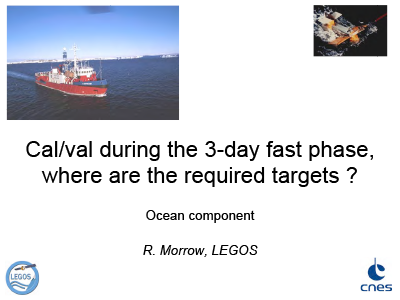 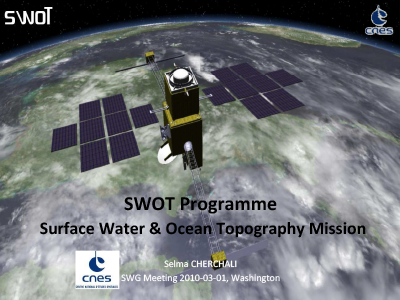 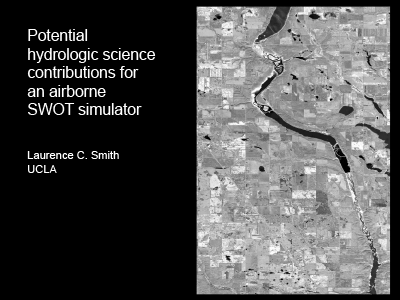 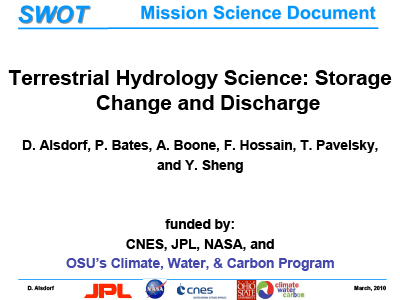 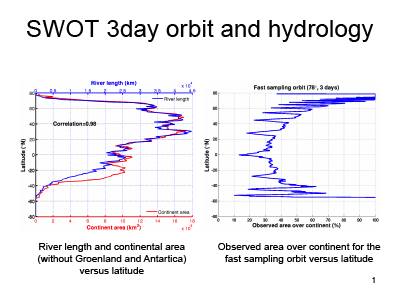 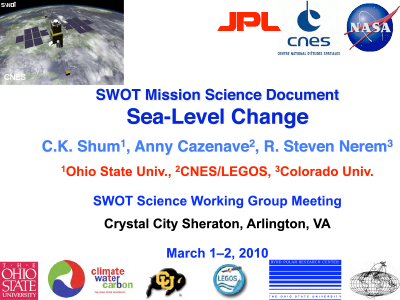 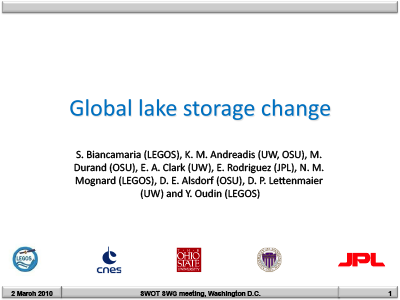 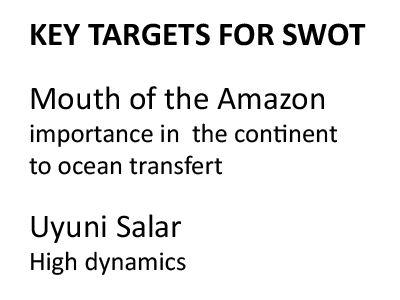 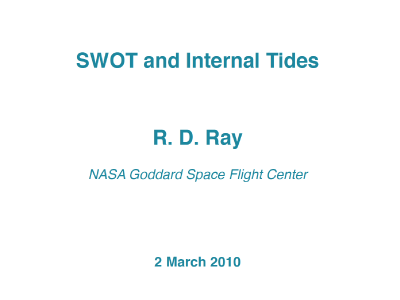 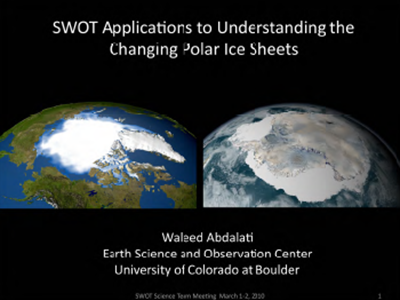 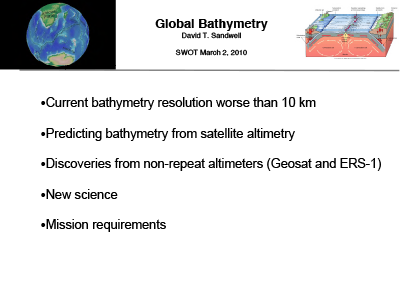 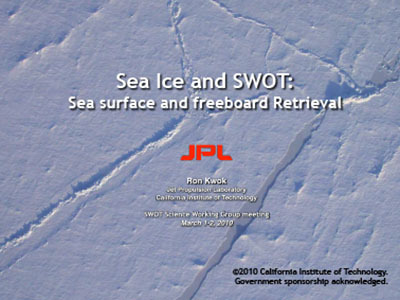 The Science Working Group of the Surface Water and Ocean Topography (SWOT) met in Arlington, Virginia for the first two days of March 2010. 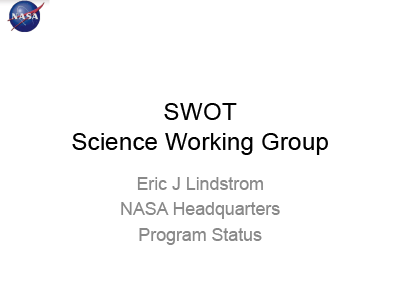 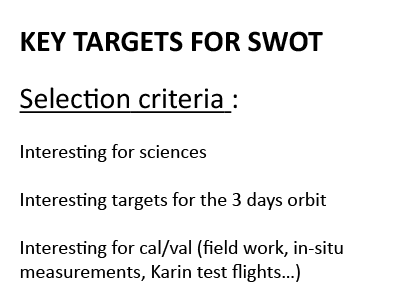 The forty-six participants focused on the SWOT measurement system, mission science, and airborne campaign. 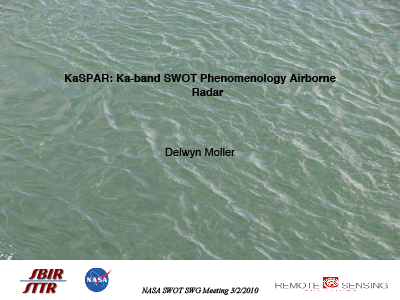 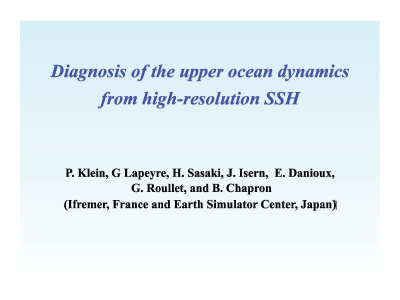 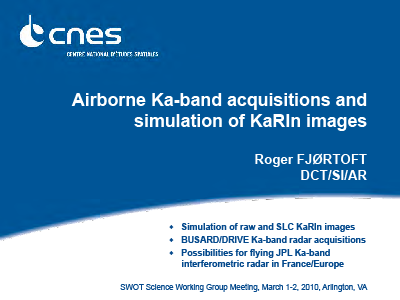 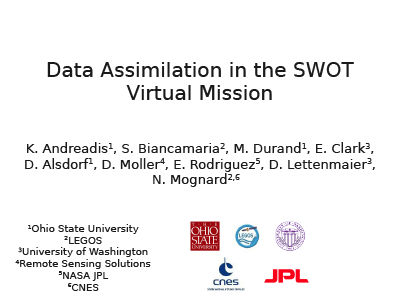 Measurement system presentations centered on SWOT's primary instrument (Ka-band Radar Interferometer, KaRIn), error budget and reduction, and mission design studies. 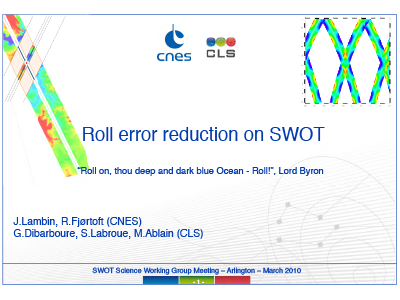 [01-Mar-10] Lambin, J. and Fjørtoft, R.
[01-Mar-10] Lambin, J., Fjørtoft, R., Dibarboure, G., Labroue, S., and Ablain, M.
[02-Mar-10] Strub, T., Chao, Y., and De Mey, P.
[02-Mar-10] Andreadis, K., Biancamaria, S., Durand, M., Clark, E., Alsdorf, D., Moller, D., Rodriguez, E., Lettenmaier, D., and Mongard, N.
[02-Mar-10] Klein, P., Lapeyre, G., Sasaki, H., Isern, J., Danioux, E., Roullet, G., and Chapron, B. 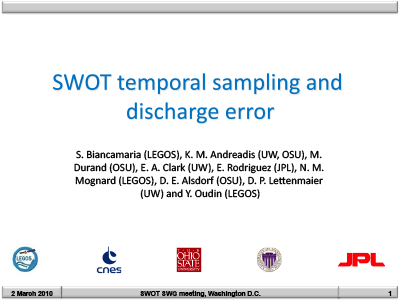 [02-Mar-10] Durand, M., Alsdorf, D., Andreadis, K., Lettenmaier, D., Moller, D., Wilson, M., Rodriguez, E., and Trigg, M.
[02-Mar-10] Biancamaria, S., Andreadis, K., Durand, M., Clark, E., Rodriguez, E., Mongard, N., Alsdorf, D., Lettenmaier, D., and Oudin, Y. 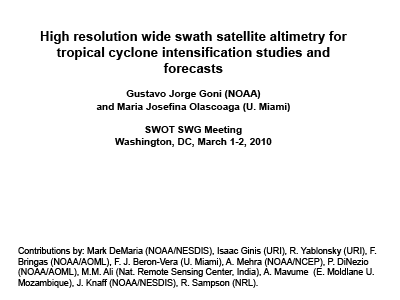 [01-Mar-10] Esteban-Ferndandez, D. and Rodriguez, E.
[01-Mar-10] Rodriguez, E. and Fjørtoft, R.
[02-Mar-10] Shum, C.K., Cazenave, A., and Nerem, S.
[02-Mar-10] Lee, H., Durand, M., Jung, H.C., Alsdorf, D., Shum, C.K., and Sheng, Y. 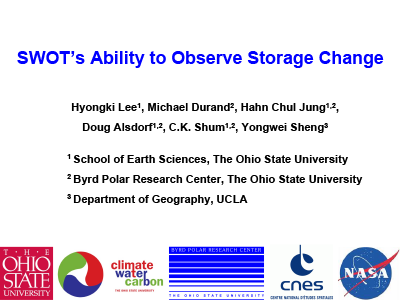 [02-Mar-10] Alsdorf, D., Bates, P., Boone, A., Hossain, F., Pavelsky, T., and Sheng, Y. 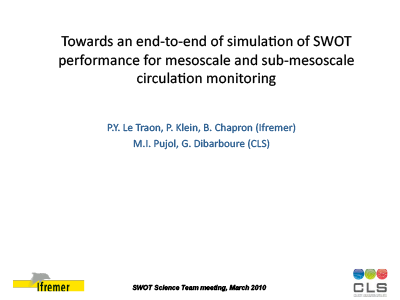 [02-Mar-10] Le Traon, P-Y., Klein, P., Chapron, B., Pujol, M.I., and Dibarboure, G.
[01-Mar-10] Obligis, E. and Brown, S.